reparing Long Straw Thatch, from the rick to the yoke… From being the most commonly used thatch, long straw now runs a poor third, to the two other main thatching materials available today. Water reed has made inroads into both types of cereal thatch, but long straw has suffered at the hands of combed wheat reed as well. This position has been reached, mainly due to a myth; which needs to be dispelled. 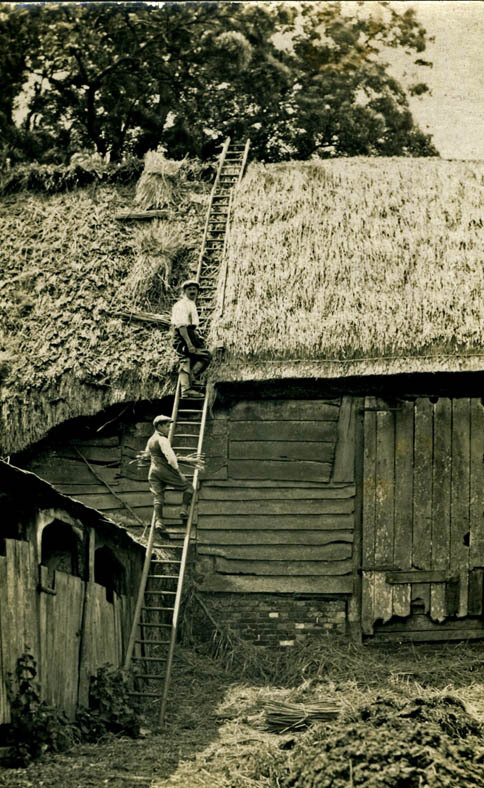 That roofs in long straw do not last as well as the other main thatching materials. 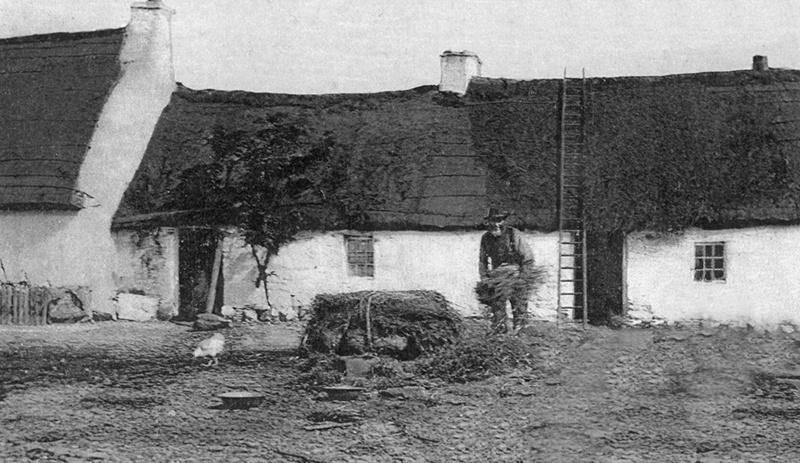 In the past, what did last but a few years, was some very rough thatching; based on the art of thatching ricks, which provided a cost effective, short lived thatch. 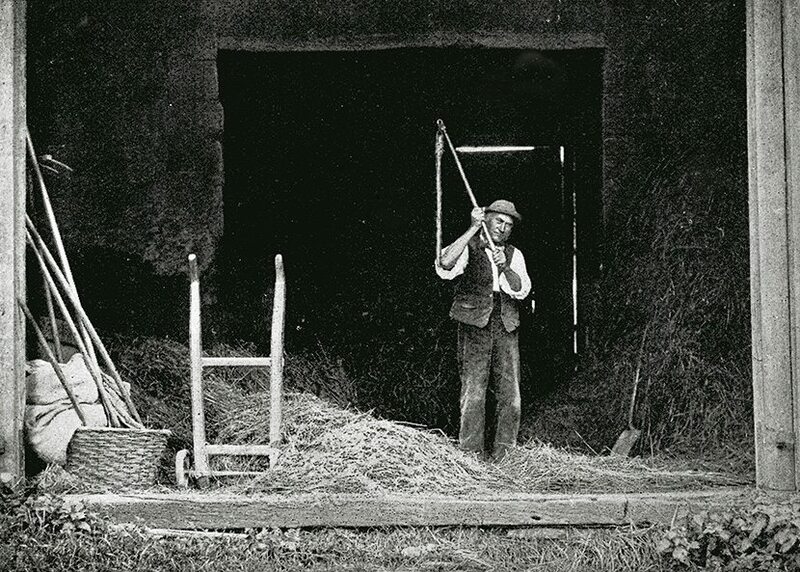 This was thatching using long straw as a material; but not using the standard long straw method of working. 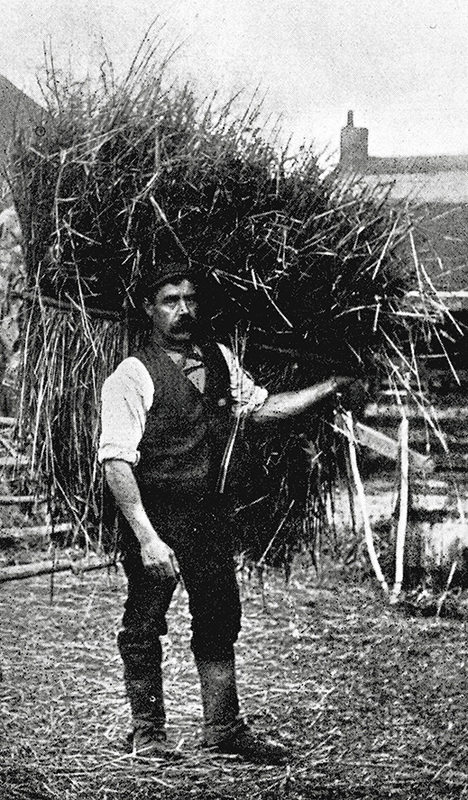 As confusingly, long straw describes both a type of thatch and a standard thatching technique. Not the real thing… But both these cottages, are covered with quite legitimate forms of thatching; that use long straw as a material. 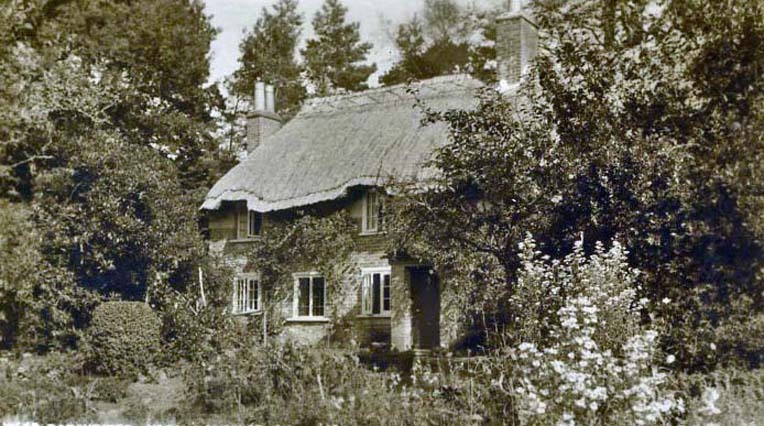 On the left, is the famous birthplace of Thomas Hardy, in 1947. With a thin, austerity, post war coat of long straw. Similar to that covering many of the local hay ricks. 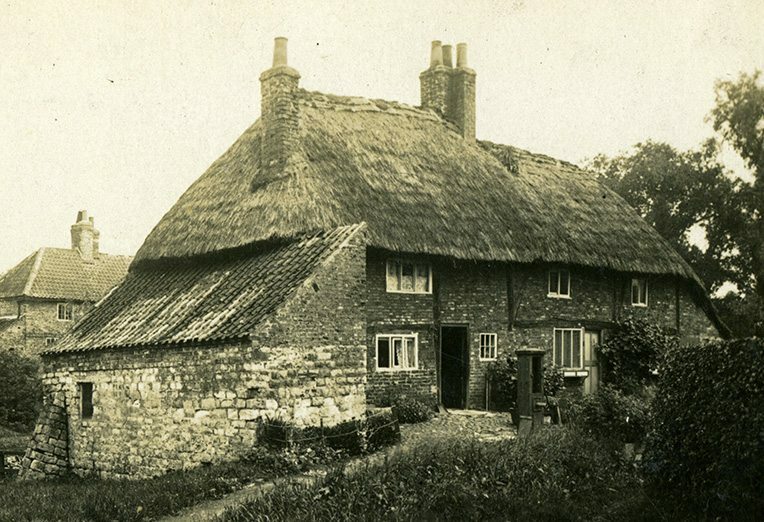 In the more affluent days, of half a century before; this roof sported a neat coat of combed wheat reed… On the right, is a long gone Yorkshire thatch, at Bolton Percy. Covered using the ‘stobbing’ method; which will be examined in the technical section. It is difficult to appreciate just how dominant standard long straw thatching once was. A 1959 survey found, that away from the combed wheat reed areas of the West Country; ninety per cent of thatchers could use the material. Today, the danger is that we may be heading for a reversal of that position. However all is not lost, as in many areas, especially in East Anglia, long straw thatching is still plentiful. Providing some very attractive, long lasting thatch. 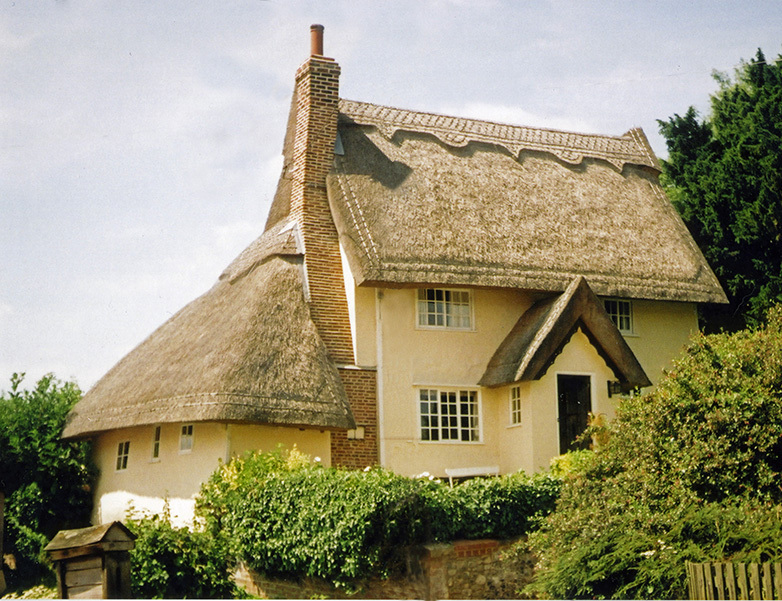 The real thing… Immaculate long straw thatching, at Kersey in Suffolk. 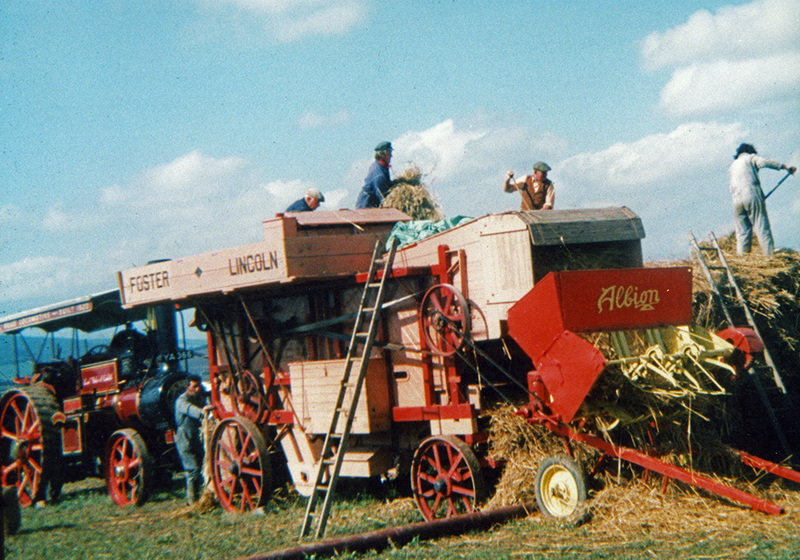 When referring to thatching materials the term Long Straw, is applied to cereal straw that has been thrashed to remove the grain. It does not necessarily have to be wheat straw; but the vast majority is. The thrashing machines used to produce today’s material were, like the binders, once the height of modernity. Until the coming of the harvester that combined the functions of each. The thrashing, a combine harvester gives the straw, is far too severe, for it to be of any use as thatch. Before this mechanization, thrashing was done entirely by hand, with one of the simplest implements known; the flail. 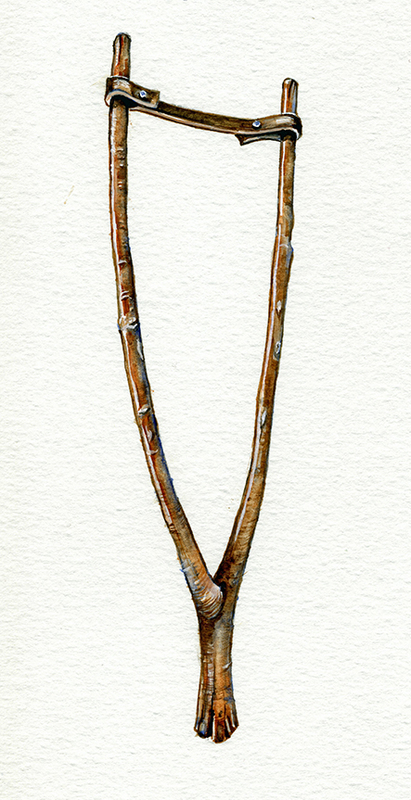 To the Ancient Egyptians this tool was the symbol of Lower Egypt where they grew their grain. So it has a very long history. Almost gone… When the photographer, Henry Taunt, captured this scene, in the late nineteenth century, the flail was fast becoming a memory; over most of Britain. The tool consists of a long wooden handle, jointed to a shorter, heavier length of wood. For centuries each winter, farm labourers worked their way through the harvested cereal crop; rhythmically loosening the grain from the straw, on thrashing floors, in barns over most of Britain. This was hard slow labour but it gave inside work and wages, through the winter months. If the straw was being saved for long straw thatch, the thrashers stuck carefully; preserving the straw as much as possible. 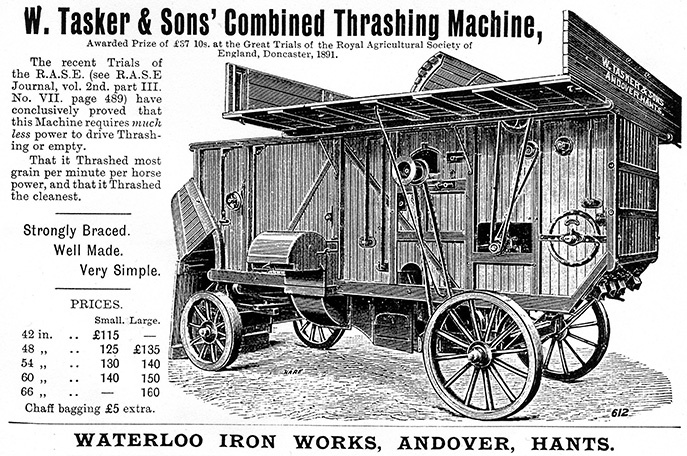 In the late eighteenth century, the first mechanical thrashers appeared in Scotland. These were static, being driven by water or horse power and later by steam. In Warwickshire in 1813, it was reckoned that machine thrashed wheat cost a quarter of that produced by hand. It seemed that a revolution was underway; but putting an end to the hand flail, would create a rather bloody one. The potential loss of a winter’s work was not taken kindly; by the thousands of farm labourers who depended on it. Things came to a violent head, in the autumn of 1830. Around four hundred thrashing machines were destroyed; and many thatched ricks burned. The unrest being mainly in East Anglia and from Kent to Dorset. Convicted farm workers were sentenced to seven years transportation; for ‘machine breaking’. Nearly five hundred souls finding themselves on their way to Australia. Setting a rick on fire drew a death sentence. These were often reduced to transportation, but perhaps as many as a score, of ‘certain wicked incendiaries’; received the ultimate punishment. By the mid nineteenth century; mobile thrashers were common. These are basically the type of machines in use today. The means, to both haul and power the machine; the steam traction engine also dates from this period. Rear View.. This little Fordson tractor seems to have had a lot to do! From here, the filling sacks of grain can be seen. Above them, the sheaves are being fed into the thrashing drum. In the background, an elevator is taking the thrashed straw, up to a forming rick. The location of all this activity, in around 1925, is unknown. But the tractor’s registration number suggests a location in Surrey. Most machines run on the same basic principles… The sheaves are fed into the top of the thresher. Down past a revolving drum, with attached beaters; which loosen the grains of corn. The grain and straw are further separated, when both pass along the conveyor like straw shaker. The straw is then ejected. The grain then passes over moving riddles which further clean the crop. Blowers then remove the chaff, and the finished corn falls into waiting sacks. At the other end of the machine, the thrashed straw has emerged. 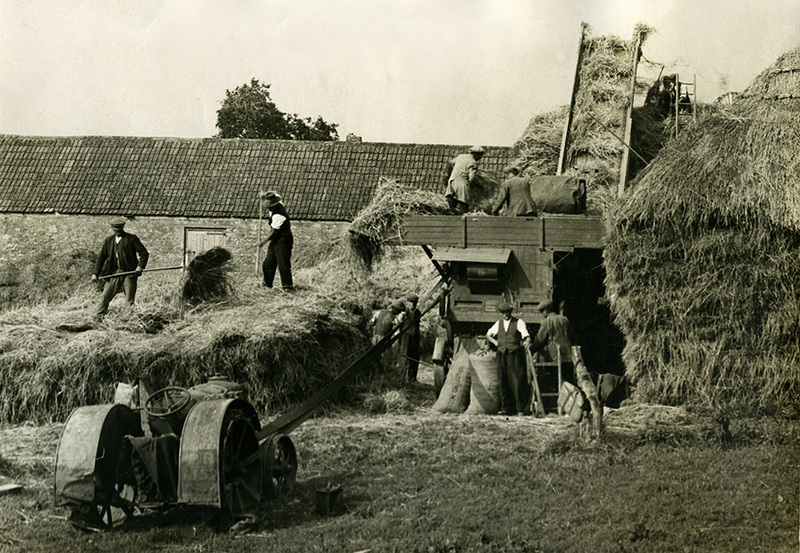 The straw is nowadays gathered and tied into bundles, by a separate machine; a one or two string tier. Front view… Back to steam power, in the form of a traction engine. This modern crop falls into a tier, as it leaves the thrasher. The various belt drives are also clearly visible. Summer shows and steam fairs are a good way to see this old, but useful machinery, in operation. Most mechanical tiers are set to produce bundles of around 14lbs (6.3kgs). It takes around 40 bundles, to thatch a 100 sq ft square. Or approximately 4 bundles to a square metre. About 150 bundles make a tonne, which covers about 4 squares, or 37 square metres, of long straw thatching. 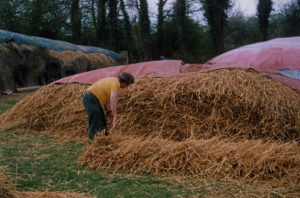 Long straw requires considerable preparation, before it is ready for thatching. Firstly, the bundles of straw are opened and the straw is thrown forwards, usually with a fork; to form a layer. Water is then used to soak this layer. This process is repeated. When enough layers have been wetted, a Bed is formed. Enough time should then be allowed, for the straw to soak up the water thoroughly; before the second stage of preparation. All this soaking is for a good reason, as wheat straw becomes much more pliable and easier to use, when wetted. Yealming… The thatcher now sorts the straw into standard amounts that can be carried to the roof and laid. This sorting is called Yealming. The handy sized amounts are the Yealms. To make these the thatcher stands by the bed; and from the side pulls double handfuls of straw. The straw held by the hands, is called the Large End, the other the Small End. (This creates a tapered material; necessary for any successful, standard thatching.) Finally the thatcher pulls the laid straw towards the feet; compacting it as much as possible. Until a width of around 18 inches (450mm) is obtained, with a depth of between 5 and 6 inches (125/150mm). When picked up this becomes a yealm. These are generally a little longer, than the length of the long straw itself. The yealms are then loaded into the thatcher’s yoke, with the large ends all facing the same way. Around six to eight usually fill the yoke, ready for transport to the roof. The amount of long straw in a full yoke, was often called a Burden; quite an apt name. Or yealm as you go… As this gent from Ballantrae in Ayrshire is doing. He has his straw held down by a weighted rope. From which he can pull the straightened stems. Probably to thatch his own cottage. As was the custom, over much of Scotland, when our man stopped for the camera, well over a century ago.